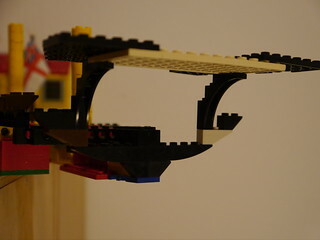 @Legostone I don't think it is too thin. It would just have to widen instantly after the first few layers. This is how I'm maybe going to do it. Really narrow just beneath the water line. 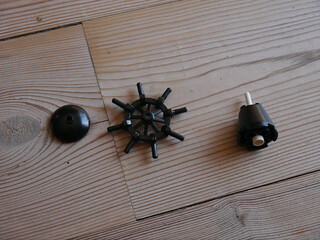 Same goes for the bow, for which I use the quarter saucer base (30201). With both these curvations given, I have to figure out how to smoothly merge into the nearly vertical shape midships. @Bodi That shape looks fabulous. Can't wait to see more. Sometimes the interior has to give way to more important priorities. 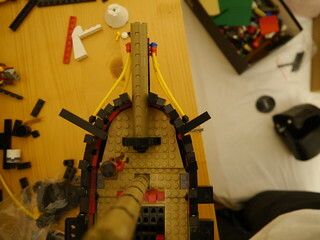 The pictures only show the shape, the structure will include more technic bricks, improving the stability a lot. 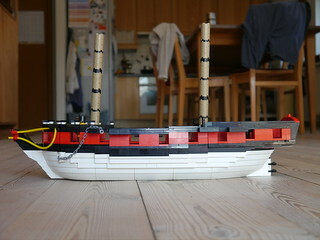 I hope, the transition appears to be a bit smoother, once it is all black and stretched along the entire length of the hull. I'm just semi-open to new solutions, because I'm quite stubborn about the idea of building it in a way that is close to my other ships. In this case meaning all studs head up, not too many brackets. But still I wish to hear your ideas and thoughts. 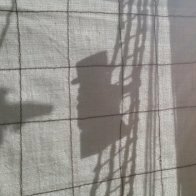 I am still working on the rigging, sails, and other details of this gaff cutter, but would like to be sure of her class rating. 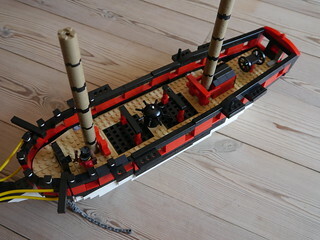 Her deck is approximately 30 studs in length, and 12 studs at her widest. IMO she could be a large Class 2 or a small Class 3. A class 2 is narrow hulls w no midsections or 1 very light (25x12 or a little longer) and a class 3 is narrow hulls w 1-2 mid sections... iirc 33x12 (not including any deck overhang)... your cutter has some mass to her (assuming it’s not like 2-3 studs from ground to deck); it’s probably your choice. Of course I’m a little biased, I licensed the Black Rat as a Class 3 and she’s 32x10 which displaces less than your cutter. sure﻿ of her class ra﻿ting. By these numbers, she sound very similar to my class 2 "rover" cutter. And my immediate reaction is class two too. 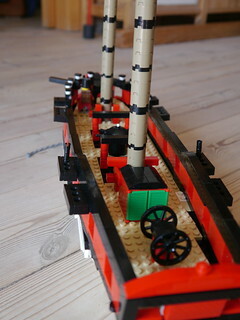 She seems lightly and narrowly built and low to the water. 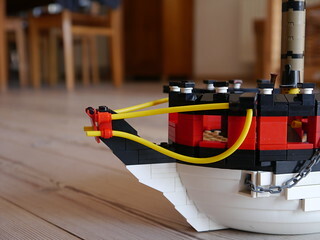 A fast little craft. 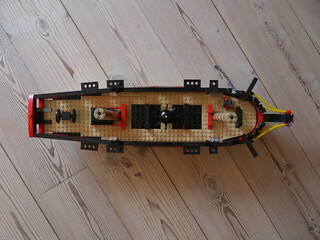 However, it is a bit hard to say without a minifig or two to judge scale and a little more light on the photo. Would also like to see a photo from the side. I think you're right. 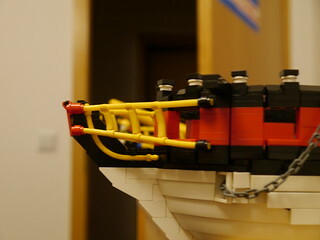 Her hull is quite shallow, as it is this assembly I got from a City set. 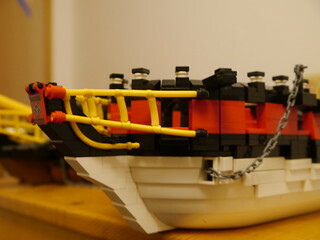 Inspired by @Legostone's technique to embellish the narrow prefab hull, I wanted to give it a try myself. 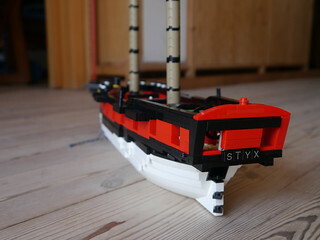 I always liked the white hull parts, but didn't know how to cover the black part properly. I copied the base nearly without changing anything. From then on I just followed my guts, looking at some pictures of brigs from time to time. 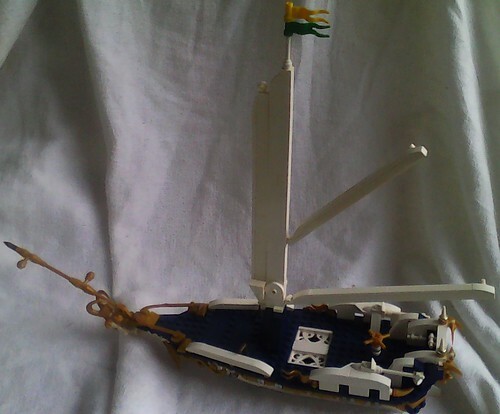 I want to rig the vessel as a hermaphrodite brig/brigantine. She can now hold up to 18 guns, but due to the scale I probably won't arm her. Or I will have to come up with a new gun design. Still have to change some colours. Unfortunately I have to buy tons of new bricks again. 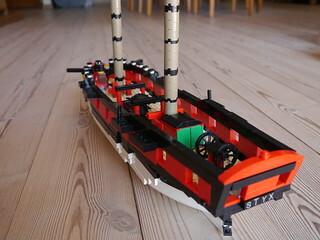 Same goes for the names, I don't have any R-letter tiles, therefore my HMS Argonaut currently carries the name HMS Sjælland and on the photos of the brigantine you see the name Styx while actually I want to name her HMS Ymir. I was forced to come up with a new capstan design. It was worth it, but I'm not happy with it being all black. Will have to change at least the cone to white. Again, the headrails are quite enormous. And I'm not that sure about keeping the shape this way. Especially the turn of the lower rail. 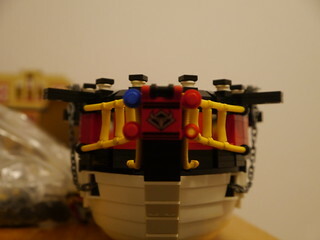 It mimics the headrails on my frigate, where it fits the design. What do you think, should I keep it or change it into two parallel rails? Greetings and happy Easter, Wellesley! @Wellesley I always love the narrow hull pieces. 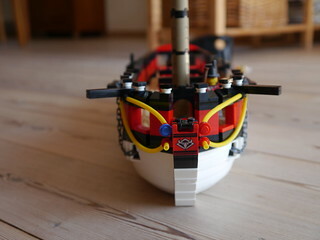 Did you remove the colored toppers for the bow/stern? For the headrails... Honestly, I’m not sure. They look fine. I wonder though about color... the yellow really draws your eyes which can make the size/shape much more noticeable. This is the updated, better version of the headrails. Here you can see two catheads of different length. Which one looks better? @Wellesley Classically cat heads weren't very long as they only had to be long enough to keep the anchor from fouling on the hull. The longer the timber, the greater the chance it could break under strain. The shorter of these two is likely sufficient.